Is there a better alternative to 3 Word Review widget? Is 3 Word Review widget really the best app in Animation category? Will 3 Word Review widget work good on macOS 10.13.4? Experience the wonder that is the 3-word movie review right on your desktop. 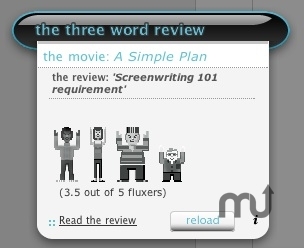 Through the magic of Mac OS X 10.4, this widget will generate a random 3-word review from our hundreds of movie reviews. You can then click for the full review, or spend your day infinitely entertained as different 3-word reviews are loaded. You will also see how the movies fared on our scale of 1 to 5 fluxers. Enjoy! 3 Word Review widget needs a rating. Be the first to rate this app and get the discussion started!